This is the Brazilian (Portuguese) paperback edition of The First Eagle. 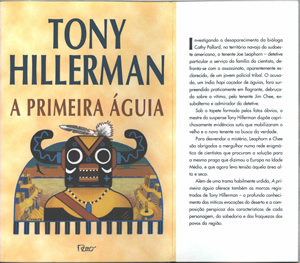 Published in Rio de Janeiro by Editora Rocco Ltda in 2001, it features Peter Thorpe's cover art from the US edition. Translation is by Léa Viveiros de Castro. The front cover has a mottled pale peach background, with Tony Hillerman's name printed in large type at the top in dark teal blue. Below that, the novel title is printed in red. Peter Thorpe's kachina masked figure, somewhat resembling Ahote kachina, stands in front of a half moon shaped frame containing a Pueblo cliff village and an eagle swooping through a southwestern sunset. The publisher's imprint is printed at the bottom center. The paper covers have front and back flaps. On the front flap is printed a synopsis of the novel, and on the back flap is Tony Hillerman's biography and photograph. The back cover has a simple synopsis printed in black on the mottled peach background, below a detail of the kachina figure and background from the front cover illustration. The bar code is at the bottom right of the back cover. The spine is dark teal and the novel title, author's name, and publisher's logo are printed on it in white. Binding: Full-color paper covers with flaps. The spine is dark teal and the novel title, author's name, and publisher's logo are printed on it in white.